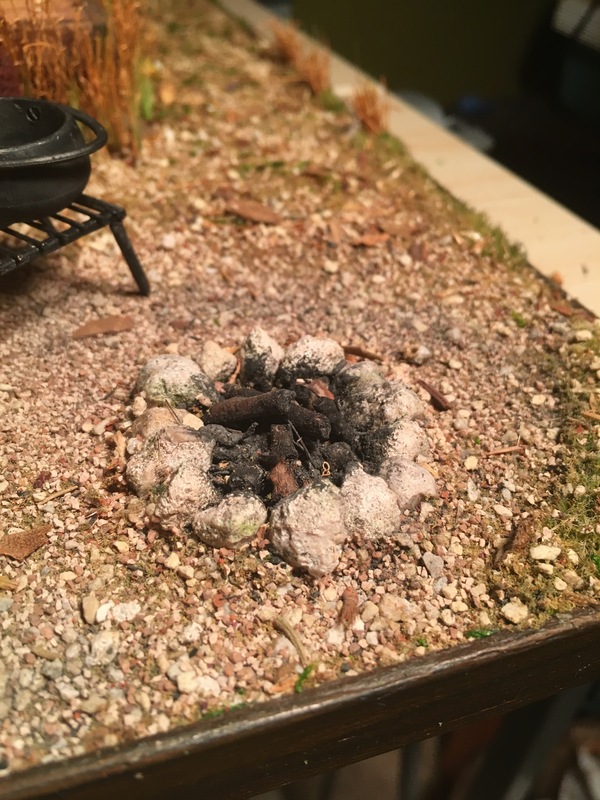 “Well, you see, I’m creating a dollhouse sized wall tent set in 1950’s Africa and I needed realistic looking ash and burned sticks for the fire pit. The tweezers were so I didn’t burn myself, obviously.” – see totally normal. Before I had even started this built I had bought the little black pot. I was planning on hanging it above the fire pit, but it doesn’t hang level. I wouldn’t want any food to spill out on the fire. I don’t like being wasteful when I camp. 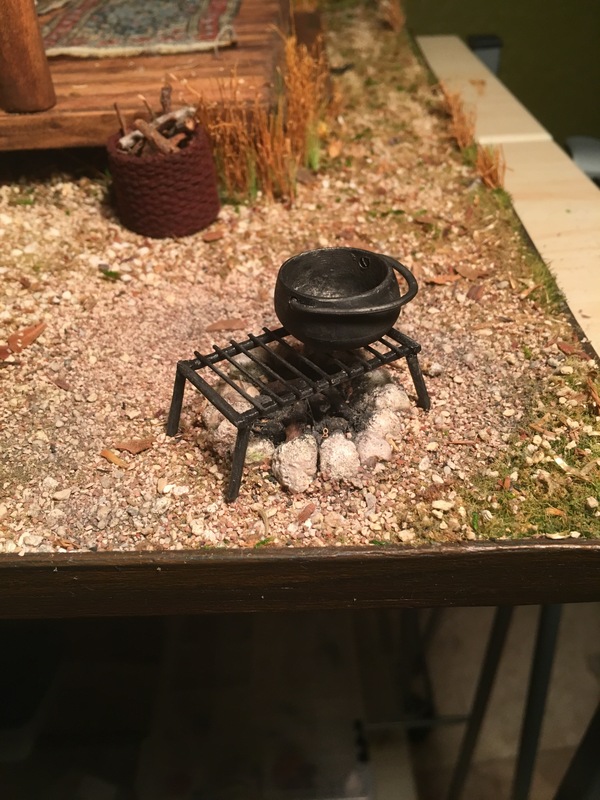 I built a little over the campfire grill grate thing (technical term). Now my little adventurer can make something in the pot and something on the grill. It’s made out of thin wire, toothpicks, super glue, a few choice words, and paint. Obviously from reading my story above you already know that I had decided that the best way to get authentic looking ash and burned logs was to use authentic ash and burned sticks. Ash was brushed onto the rock ring and around the campfire as well. And I’m calling it done. Another item crossed off the list. Unless I decide something needs to go into the pot. I worked on some lighting this week too, but haven’t gotten pictures yet. I’ll take some when I’m done with that part. I also decided I needed a fourth rug for the porch area. Of course it’s the one that gave me the hardest time. Using the dremel to sand the rug caused the threads to pull through making the whole rug bunch up. Then I had to do extra trimming on the front and back to get it to flatten out. I ended up dousing it with starch and ironing it. It’s nice and flat now, it just looks extra well worn. After the lighting is installed, the roof goes on, decor goes in, and then I finish landscaping the open side of the tent, then I think I might be done. Crazy. Perfectly normal behavior! Love how it looks. Your grate is ingenious. And I really like your little basket of wood for the fire.